Days of Our Lives (DOOL) spoilers tease that another big departure’s on the way. There have been rumblings about Christopher Sean’s (Paul) exit for a while now, but his fans held out hope that he’d stick around. Unfortunately, Sean has indeed decided to leave the NBC soap. In fact, he’s already taped his final scenes. According to Soap Opera Digest, Sean wrapped up filming back on May 25. That happened to be the same day Marci Miller (Abigail) finished filming as well. Sean is hoping to pursue other projects and he’s already off to a nice start. He’s voicing a character in a new animated TV series called Star Wars Resistance. Sean has also had some primetime parts in the past. A notable one was his role as Gabriel Waincroft in the Hawaii Five-0 reboot. Sean now has more free time for auditions, so hopefully he can find similar work in other films and television shows. Of course, many DOOL viewers are bummed about this news. Days of Our Lives spoilers say Paul’s love triangle with Will (Chandler Massey) and Sonny (Freddie Smith) is just about to heat up! On the bright side, Sean will remain on screen for a few months. Due to the show’s taping schedule, he’ll be around to finish this story. You can catch Sean until sometime this fall, so we can enjoy his portrayal for a while longer. It’s possible Days will recast, but they may opt to develop Will and Sonny as a pairing again instead. The love triangle should be over by then, so the show could explore “WilSon’s” next chapter. Paul may leave town in despair or even face a grim fate. There’s no word on his official exit storyline yet, so we’ll keep an eye on that for you. 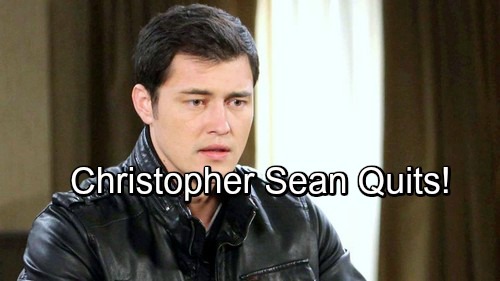 Will you miss Christopher Sean in the role of Paul? Do you think Days should recast or give Paul a huge sendoff with some great material? We’ll give you updates as other Days of Our Lives details emerge. Stay tuned to DOOL and don’t forget to check CDL often for the latest Days of Our Lives spoilers, updates and news.